Design & The City is a four day event exploring citizen-centered design approaches for the smart city. The Mobile City’s Martijn de Waal is appointed as the overall programme-coordinator, and The Mobile City is proud to serve as a media partner to the event. 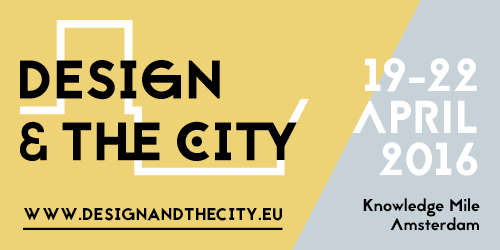 Design & The City takes place from April 19 to April 22 2016 in Amsterdam at the Knowledge Mile: an area in the heart of Amsterdam which runs from the Amstelplein to the Nieuwmarkt. A coalition of universities of applied sciences, citizens, municipality, organisations and companies has formed an applied research ecosystem to develop, test and display smart solutions for metropolitan challenges in the area. The Knowledge Mile is an initiative of the Amsterdam Creative Industries Network. Coalition partners (among others) of the Knowledge Mile are: Amsterdam University of Applied Sciences, Bell Labs, Rabobank, KPN, NS, We the City, Waag Society, Amsterdam School of the Arts and Inholland University of Applied Sciences. In the last few years, the rise of digital and mobile media has changed everyday life in our cities. From finding a restaurant or place to stay to campaigning for or against a new urban development with fellow citizens to the monitoring of traffic and crowds by city officials during large events; as a current add wants it, in our contemporary cities there’s an app for that. Or a website, an online service, a dashboard or other digital media platform. More recently the rise of sensors and (big) data has provided us with yet another new range of opportunities and promises for the future of our cities. The network society, heralded by scholars and Silicon Valley entrepreneurs alike, is slowly turning into a platform society: a society in which personal, social and political relations are organised through the interfaces and algorithms of digital media platforms. Rather than changing our cities merely quantitatively (GPS-navigation may get us there 5% faster, CO2 emissions may go down by 12%), this has a qualitative impact on our urban societies. New modes of social organisation, of economic production and political decision-making have started to appear. Relations between and roles of citizens, designers and policy makers have started to shift. These developments raise as many challenges as they provide new opportunities for the design of liveable, sustainable and sociable cities. Privacy, power and processes of in- and exclusion are important issues of concern. How can we design our cities and their technologies from a perspective of the public interest? Design & The City address these issues through three subthemes. The first is designing for the changing role of citizens. How can citizens meaningfully be engaged in the process of city making? Second we will discuss design strategies for new modes of social and economic organisation: What new social processes and business models do we need for the future of city making? And third we will look at the role of the professional in the process of city making, and the new design methodologies, approaches and roles they have taken on towards the creation of a sociable smart city.